This is a black and white snapshot of Joe Bassano, brother of Antoinette (Toni) Ciccarelli, with his cousin. 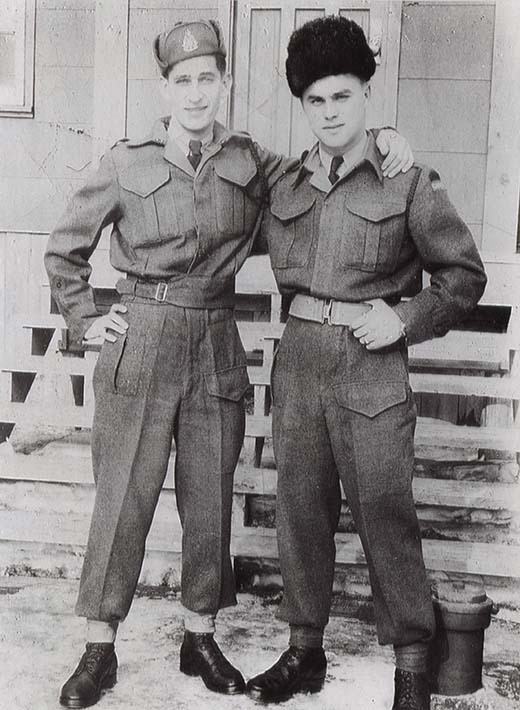 Both men are wearing their Canadian military uniform. Joe has on a trooper or trapper's hat with a logo at the front, a white shirt and black tie, and matching jacket and pants suit. Thejacket has a collar, large chest pockets, and epaulettes on the shoulders. A fabric belt is tied around the waist. Joe's matching pants also has the same type of large pockets and his black boots are laced and ankle-high. His cousin is wearing a similar uniform but his trooper hat is made out of fur. The cousins are standing with their arms around each other's shoulders. They are standing in front of a wooden building structure and steps.